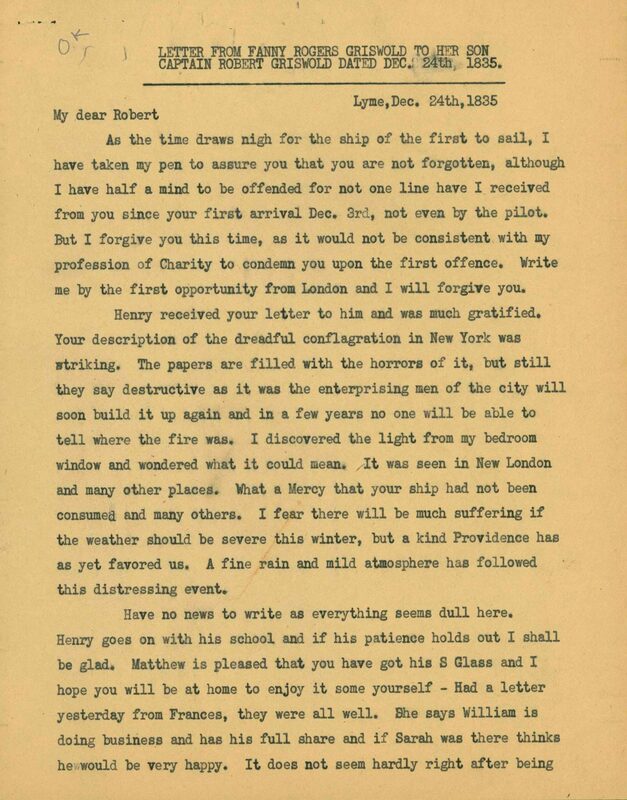 Having taken command of the newly launched packet ship Toronto, Robert Harper Griswold, age 29, is in New York preparing to sail on January 1st, overseeing the loading of freight, and attending to the needs of passengers. His mother Frances Rogers Griswold (1767-1863) in Lyme gently chides her youngest son for not writing from New York and urges him to write soon after he reaches London. She sends news of family and friends and devout wishes for his safe return. As the time draws nigh for the ship of the first to sail, I have taken my pen to assure you that you are not forgotten, although I have half a mind to be offended for not one line have I received from you since your first arrival Dec. 3rd, not even by the pilot. But I forgive you this time, as it would not be consistent with my profession of Charity to condemn you upon the first offense. Write me by the first opportunity from London and I will forgive you. Henry Robert’s oldest brother Augustus Henry Griswold (1789-1836) had commanded multiple ships on both Atlantic and Pacific crossings over 25 years. After retiring to Black Hall, an area of Lyme at the mouth of the Connecticut River where pioneering settler Matthew Griswold (1620-1698) built a homestead in the late 1660s, Henry taught in the district school that he helped build near his home. 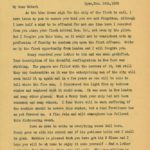 received your letter to him and was much gratified. 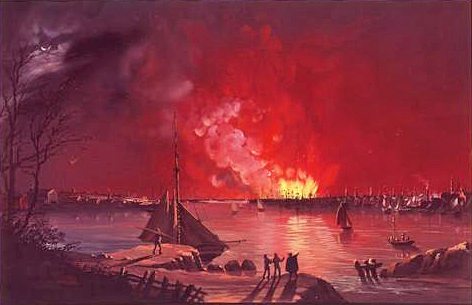 Your description of the dreadful conflagration The Great Fire that devastated New York City in 1835 broke out in a warehouse on December 16. Frigid temperatures that winter, dropping to -27F, had turned the East River to ice, and water froze quickly in fire brigade buckets and hoses. Eventually dynamite was used to blast away buildings in the path of the blaze. in New York was striking. The papers are filled with the horrors of it, but still they say destructive as it was the enterprising men of the city will soon build it up again and in a few years no one will be able to tell where the fire was. I discovered the light from my bedroom window and wondered what it could mean. It was seen in New London and many other places. I fear there will be much suffering if the weather should be severe this winter, but a kind Providence has as yet favored us. A fine rain and mild atmosphere has followed this distressing event. Have no news to write as everything seems dull here. Henry goes on with his school Subscribers, including Governor Roger Griswold, agreed in December 1806 to build a school at Black Hall to educate children in that section of Lyme. The building was 17 x 14 feet. 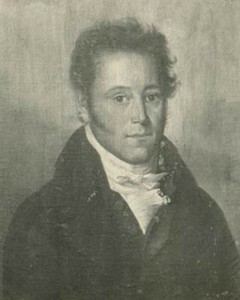 Augustus Henry Griswold, the governor’s son, would serve as a teacher at the school in the 1830s after his retirement from the sea. and if his patience holds out I shall be glad. Matthew is pleased that you have got his S Glass and I hope you will be at home to enjoy it some yourself – Had a letter yesterday from Frances, they were all well. 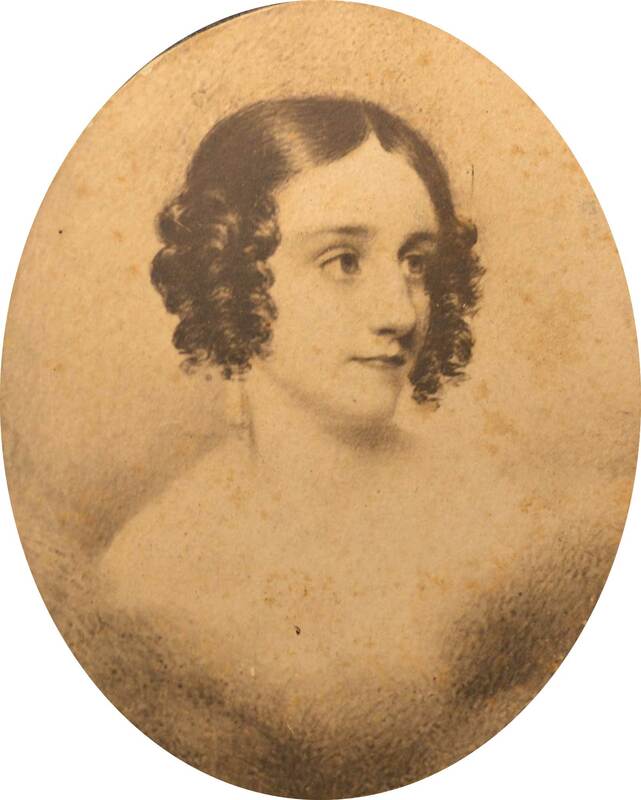 She says William Robert’s brother William Frederick Griswold (1804-1851), also an experienced ship’s captain, engaged briefly in business in Norwalk, Ohio. is doing business and has his full share and if Sarah While William Griswold pursued business interests in Ohio, his wife Sarah Noyes Griswold (1815-1903) remained in Lyme in her family’s home, the elegant mansion house built in 1817 by architect Samuel Belcher (1779-1849) that Robert would purchase six years later after his marriage to Helen. was there thinks he would be very happy. It does not seem hardly right after being so much separated that they should now be so far apart. Home of Fanny Rogers Griswold and Governor Roger Griswold, Old Lyme, Connecticut. Harper’s New Monthly Magazine, February 1876. They are much engaged in Norwalk Norwalk, Ohio, was founded by migrants from Connecticut, who moved to the region following the War of 1812. The territory, including the Firelands subregion that is home to Norwalk, was part of Connecticut’s Western Reserve, originally set aside for settlers from cities burned by the British during the Revolutionary War. 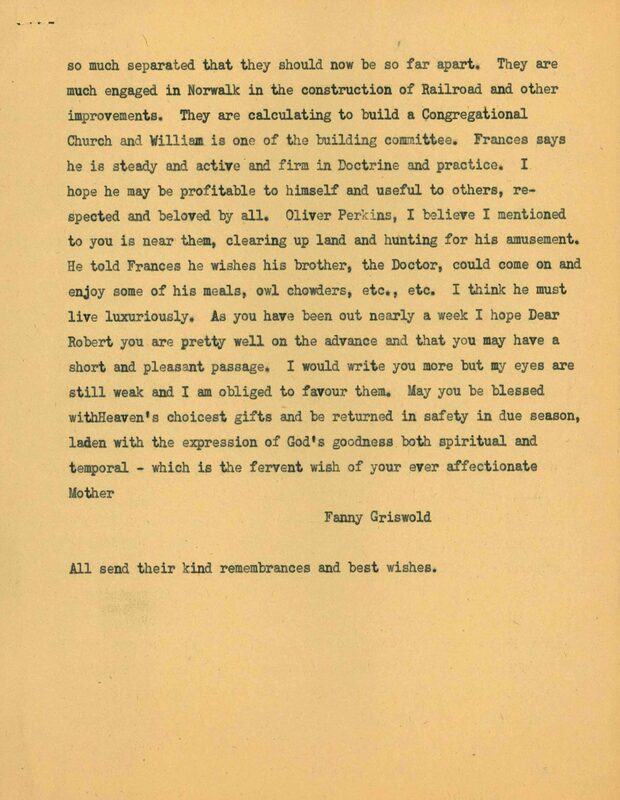 Three of Fanny Rogers Griswold’s children moved to Ohio. in the construction of Railroad and other improvements. They are calculating to build a Congregational Church and William is one of the building committee In the spring of 1835, the Norwalk congregants changed the denomination of the church from Congregational to Presbyterian. 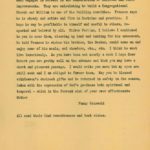 They organized a committee to raise funds for a permanent home, a process in which William F. Griswold played a substantial role. William also helped found a number of other institutions in town, including Norwalk Female Seminary. Huron Reflector (Norwalk, Ohio), June 7, 1836. . Frances says he is steady and active and firm in Doctrine and practice. I hope he may be profitable to himself and useful to others, respected and beloved by all. Oliver Perkins, The son of a distinguished New London family, Oliver Ellsworth Perkins (1806-1847) was Robert’s brother-in-law. 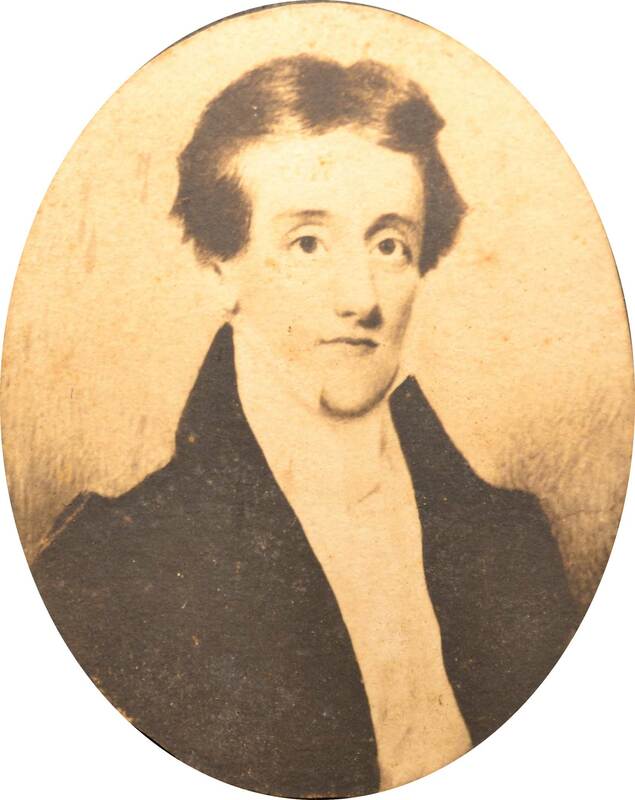 Charles C. Griswold (1791-1835), Robert’s brother and a successful lawyer in Lyme, had married in 1820 Ellen Elizabeth Perkins (1799-1877), Oliver’s half-sister. I believe I mentioned to you is near them, clearing up land and hunting for his amusement. He told Frances Robert’s sister Frances Griswold Lane (1795-1880) had settled in Ohio in 1818 with her husband Ebenezer Lane (1793-1866), a grandson of Connecticut’s former governor Matthew Griswold (1714-1799) and a distinguished lawyer who became Chief Justice of Ohio’s Supreme Court. he wishes his brother, the Doctor, Dr. Nathaniel Shaw Perkins (1792-1870) was for many years New London’s most eminent physician. could come on and enjoy some of his meals, owls, chowders, etc., etc. I think he must live luxuriously. All send their kind remembrances and best wishes.